We had expected the stockmarket to rally sharply if the Republican party had held on to the House, which is why we dumped our soon to expire Apple Puts at the good profit beforehand, but we had not expected a rally of the magnitude we saw yesterday if they lost it. So what is going on? On one level, the simple argument that the market is rallying because the election is over and the uncertainty associated with it is also over holds water, but thinking it through there is more to it than that. Even though it is normal for the party in opposition to retake ground at the mid-terms, and to retake the House, the results of this election represent a victory for the Deep State over both Trump and the American people. Why? – because Trump no longer holds a clear mandate, and the Democrats will work to frustrate and stymie any attempts by him to make significant changes during the last 2-years of his Presidency, which is why, despite Trump putting a brave face on it, he was fuming after the election, and vented on that CNN reporter in the White House press conference, who has since lost his White House press pass. 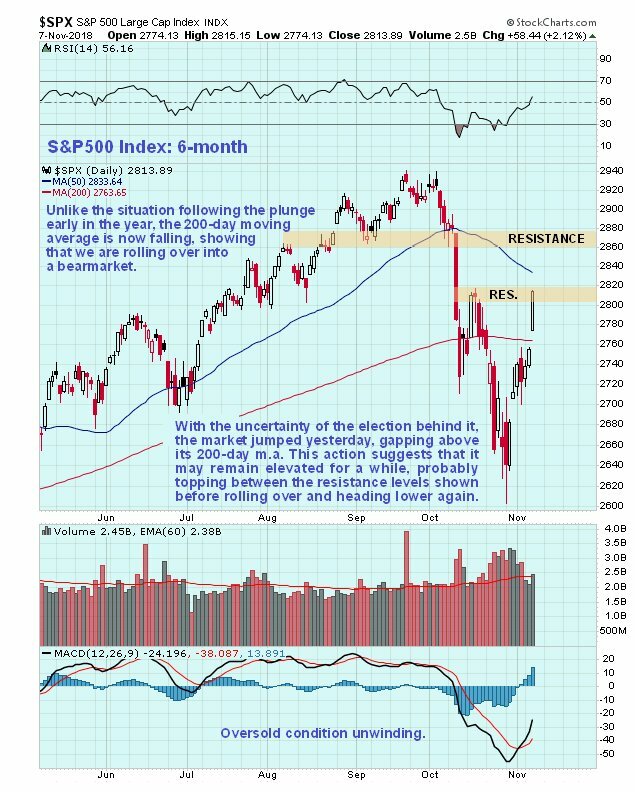 The reason that the stockmarket rallied so much yesterday, after the election results became apparent, is that it was a celebration by the Deep State of their victory over Trump and the people. The chief beneficiaries of the 10-year bullmarket in stocks have not been the “little guy” or the middle class, but big powerful interests, the fabled 1%. The majority of the population can barely pay their bills, and have received scant benefit from the stockmarket boom. So what we saw yesterday was Big Money celebrating the hobbling of Trump. Trump is now a “lame duck” President who will not be able to make the “root and branch” changes necessary to bring the country back to a state of relative normality. Even after he took office he had the common sense to realize that if he wanted to continue to live and breathe, he would have to kow-tow to the powers that be, which is why he prostrated himself before the Israel lobby, the Military-Industrial complex and even Saudi Arabia. Now, however, after the Deep State controlled Democrats have retaken the House, matters are out of his hands, since any significant attempt to take on the power of the Deep State will in effect be vetoed by the House, so to put it succinctly, they have got him where they want him. However, they have only got him where they want him until 2020 – Trump should not be underestimated, despite his quirks, and if he gets re-elected in 2020 and succeeds in taking both houses, he could be back on track to make some big changes, but in that case he will need effective personal security, as they will probably try to physically eliminate him. Especially to an outsider, like the writer, there is something tragi-comic about the spectacle of thousands and millions of people lining up in the US to vote in an election, thinking that their puny vote will somehow make a difference. The most laughable thing of all is how many voters think they still live in a democracy, which is the result of pitiful ignorance and miniscule powers of independent thought – if the US is a democracy then how come there are only the same 2 old parties to vote for?? – where’s the real competition? – answer, there isn’t any, because if they arise the system snuffs them out of existence. A vote in a US election cannot make any significant difference for 2 simple reasons – one is that the US is not a democracy, and the 2nd is that the two main parties (and the media) are controlled by the same plutocratic interests who work to create a circus atmosphere leading up to the election time to mask the fact that voters have no real choice at all. The only reasons to bother to vote are if you have a good local candidate who you believe might make some difference especially at a local level, and for the fun of observing the other mugs lining up like sheep in the polling station thinking that their crummy little vote will make a difference – and we are not even looking at the possibilities for voting machine fraud and vote rigging here – as Stalin said, it is those who count the votes who determine the outcome of elections. That’s enough about the elections and the outlook for Trump. Now, what about the outlook for the market. The most important point to make is that the election results won’t make any real difference to the trajectory of the markets. Despite the sharp rebound of the past 2 weeks the market is rolling over into a bearmarket, which is being caused by the Fed cranking up interest rates and draining liquidity from the system as it tries to offload its huge Treasury holdings, which is getting more difficult as foreigners don’t want them. To use a hackneyed old expression, the Fed is caught between a rock and a hard place, because if it continues on its present course, it will crash the stockmarket and create a recession / depression, which it is actually quite happy to do in an effort to save the bondmarket. On the other hand, if it does a U-turn to avoid crashing the market, the dollar, which is already elevated, will plummet. What it may do is crash the stockmarket partly to save the bondmarket, and then, in response to intense pressure, reverse course into a major new QE program, which then crashes the dollar. It’s a mess and there is no getting away from it. So the stockmarket, which is approaching its highs again, should roll over again soon and drop, although it may first churn between about 2820 and 2870 on the S&P500 index for a while. There is therefore thought to be no reason to liquidate any inverse ETFs here, and as for Apple, whose charts are now very bearish, it is getting close to the point at which we will do Puts again, this time rolling into later expiries. Meanwhile, the PM sector continues to look good here, and we will be looking out to make selective purchases of various stocks when they look like they are at a favorable entry points. Posted at 9.25 am EST on 8th November 18.